Every product leverages the power of SAP HANA to store and crunch the huge volumes of data involved while the SAP Business Suite (including ECC or S/4 HANA) remains as the System of Record. Users insist on a User Experience similar to what they receive every day with tablets and smart phones. Hence, User Interfaces are delivered for mobiles. Within the centre of the diagram moving from left to right from “planning”, “network” and “logistics”, there is a progression from deciding what to do, how to do and actually executing it. S&OP falls squarely in the leftmost planning box. 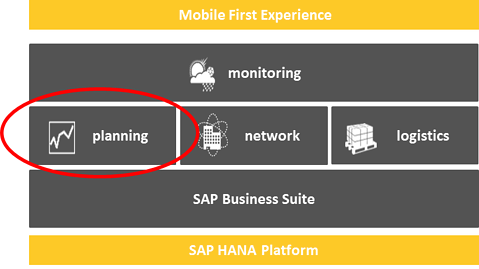 We need to understand first that Integrated Business Planning is not just a product name dreamt up by SAP. It is a planning process conceived by the Oliver Wight organisation (the same organisation which originally developed and promoted the process they called S&OP in the 1980s). In their white paper IBP for high performance businesses they define IBP as “advanced S&OP having a fully integrated management and supply chain collaboration process…that allows the senior executive to plan the whole organisation”. The process is normally run once a month and looks at a 24 month horizon. 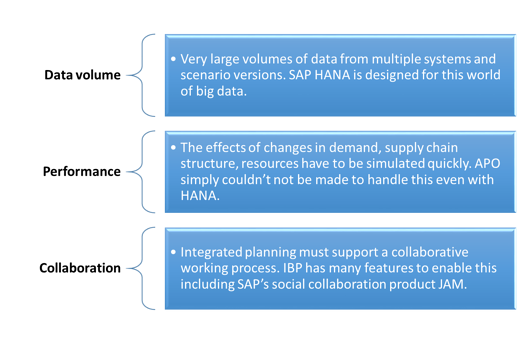 In the world of SAP, IBP refers to a suite of products of which only one is S&OP. Although one could argue that some of this functionality falls outside of Oliver Wight’s definition of IBP, they are all planning solutions that are designed to allow a wider scope of the business than supply chain planners to collaborate to make decisions. Most of SAP's IBP products are available in the current release 5.0. Meanwhile, IBP Response as part of a re-branded Response and Supply is planned for the future. All these products do not just run on HANA, but were developed to run on HANA – a very important distinction when it comes to performance! But now we have to deal with the elephant in the room – APO. Most APO consultants, including myself, have incorporated at least parts of an S&OP process in an APO Demand Planning/Supply Network Planning implementation. This includes the incorporation of financial data to allow the forecast of revenues, cost of goods sold and gross profit. IBP S&OP complements the existing SCM product set rather than replace it. APO Demand Planning is ideally suited to generating statistical quantity forecasts and capturing manual input from sales personnel and demand planners. S&OP on the other hand needs to draw data from many other systems to have the complete set of demand, supply, financial and marketing information. APO is one of these systems. In addition, large multi-national companies have and will continue to implement a global S&OP solution that integrates with multiple ECC, APO and other, possibly non-SAP systems. 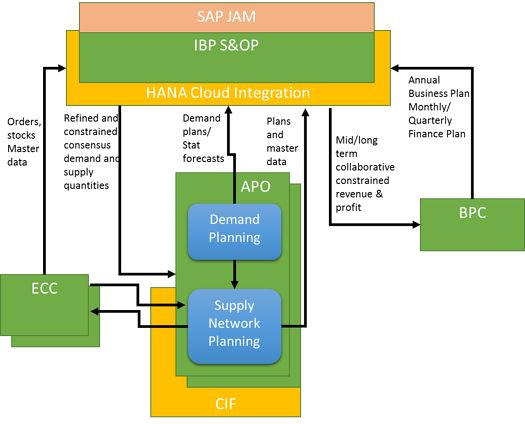 The diagram below shows one possible scenario showing the interaction between S&OP and other SAP solutions including APO. In essence ECC, APO and BPC provide all the required information to generate a holistic view of the organisations situation. This allows the S&OP participants to collaboratively reach a consensus view on any changes needed to the medium and long term plan.